For most of the past decade, the Jays have been a good team, occasionally a very good team. Yet they have nothing to show for it. The loaded AL East has suppressed the team’s win totals and prevented them from cracking the postseason. That killer competition also prompted J.P. Ricciardi to overreach at times, handing monster contracts to Vernon Wells and Alex Rios, and hurting the organization with weak draft picks. Alex Anthopoulos, Ricciardi’s successor, and his staff have overhauled the big league roster and the farm system, ditching the team’s oppressive contracts, making fortuitous trades, and drafting and developing lots of promising talent. Signing some of the team’s best players to favorable deals (Jose Bautista, Ricky Romero, Brandon Morrow, Yunel Escobar) frees up money to upgrade the roster at other positions. The 2012 club is still fraught with question marks, especially in the rotation. But Jays fans should feel optimistic. If good things don’t start happening now, they might very soon. Three years ago, Adam Lind hit .305/.370/.562, with 35 homers. 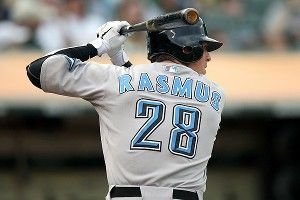 Two years ago, Colby Rasmus hit .276/.361/.498, with 23 homers. Last year, Brett Lawrie made a huge rookie splash, hitting .293/.373/.580, with nine homers in 43 games. These three players could well decide Toronto’s season. Yes, the Jays already boast a strong offense, having finished sixth in the majors in runs scored last year. But the Yankees outscored Toronto by 124 runs in 2011, while the Red Sox got 132 more. If these three potential offensive stars all break out (or re-break out) at once, the Jays go from a very good offense to a super-elite one. A team with a monster offense and an excellent bullpen might be enough to overcome a potentially mediocre rotation, especially with a second wild card in play. If you were to build an All-Star team of pitchers whose peripherals far exceed their superficial results, Brandon Morrow might be team captain. The 27-year-old right-hander has topped 10 strikeouts per nine innings in each of the past two seasons, the only starting pitcher in baseball to manage that feat (the only other starter who topped 10 K/9 IP last year was Zack Greinke, who could be Morrow’s co-captain on this imaginary All-Star team). Morrow’s high strikeout totals and high walk totals often knock him out of games early; but with the walks falling and Morrow gaining experience, there’s hope that he could find the right mix of pitch efficiency and swing-and-miss dominance to become the ace-caliber pitcher the Jays have been waiting for. That would be a huge boon to a rotation that gets thin in a hurry after Ricky Romero: Brett Cecil looks like a league-average arm if things break right, Henderson Alvarez has much to prove after a solid but low-strikeout 10-start debut last year, and Dustin McGowan’s as big a health risk as any pitcher in baseball, having made exactly four big league starts since 2008. Quality young arms like Drew Hutchison and Deck McGuire might be a year away, so if the Jays do battle their way into the race, pitching help would likely have to come from outside the organization. It’s too bad Roy Oswalt seems dead set on pitching close to his Mississippi home; had the Jays sold him on King Street instead, we’d feel a lot better about this pitching staff. Lawrie. He’s got power and speed, he’s a smidge intense, and he’s Canadian. If anything, a huge season for the young slugger is the conservative projection. Brett Lawrie has prime minister upside. Lind, Rasmus, and Lawrie go nuts, giving Bautista quality wingmen up and down the lineup. The revamped bullpen led by Sergio Santos lives up to its high expectations. And the Jays get enough out of Romero and Morrow to get them to mid-season in contention. If that happens, don’t be surprised if Anthopoulos dips into Rogers’s famously deep pockets and makes a go-for-it deal. Vernon Wells is going to make $21 million in each of the next three seasons, and he won’t be doing it in Toronto. Between one of the greatest dump jobs in baseball history and a Mike Napoli giveaway that may have handed the Rangers the pennant, there should be a 30 for 30 special on that deal.